Shopping Center Property Maintenance – DIY (Do It Yourself) or Find a Partner? Are you ready to do this shopping center maintenance work? You just bought your first shopping center. You are deciding whether or not to handle the property maintenance yourself. 1) Shopping Center maintenance requires experience and knowledge to take care of ongoing maintenance and potential unexpected issues. Do you have the knowledge, experience and time to effectively maintain your property? 2) Do you have the cash needed for ongoing maintenance, including materials and extra labor?. 3) Did we mention time? The time you spend on the maintenance of you shopping center might take you away from other important management issues. Hire a professional property maintenance company to take care of the work for you. Here are the benefits that come with this choice. Portering (trash pickup and removal) – time consuming, but necessary. 1) You save a lot of time, especially when it comes to ongoing maintenance. Portering (trash pickup, trash removal, sweeping, etc) is done on schedule and by employees who are trained for the job. Small maintenance issues are reported and resolved before they become larger (and more costly) issues. Hiring someone to focus on regular maintenance helps keep you focused on other important property management tasks. Operations, leasing, communication all go more smoothly with the maintenance process handled by a professional maintenance company. Your maintenance company can deal with the maintenance issues, you as a property owner work on the business of managing the property. 2) Everyone has that “one” person that complains all the time. Shopping complexes get it too. Your maintenance company can respond to those issues. 3) What do you know about environmental and property maintenance regulations? 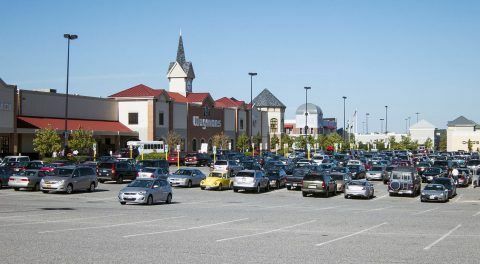 Although acquiring and owning a shopping center does have educational aspects, keeping up with local, state and federal regulations relating to environment and maintenance is usually not on property owner’s rader. These types of regulations are regularly reviewed by property maintenance professionals. Hire a professional property maintenance company you trust to work with you. Hiring someone could save you time, money and stress. Hiring someone who knows property maintenance, maintenance regulations and is committed to providing excellent work is an investment in your property. Shopping Center maintenance – Equipment and labor to do the job right. 1) There is a saying that cheap work is not good and good work is not cheap. Obtaining professional property maintenance does require a financial commitment, however it might be a small price to pay for peace of mind and tenant satisfaction. Shopping Center Property Maintenance – Do You Need a Partner? C & L Services is a third generation family owned property maintenance company. We have been providing property maintenance services to shopping center owners, commercial property owners and communities in New Jersey for over forty years. Our services include parking lot sweeping, pavement maintenance, seal coating, and line striping. If you’re in North Jersey, Contact us at 908-730-7884. If you’re in Central New Jersey call us at 732-886-1940 to arrange for shopping center property maintenance. If you’ve ever had kids, you’ll know that it’s hard to get them to stick to a schedule. Most kids learn, some never do. Getting people to cooperate is a lot like getting kids to cooperate, you’ve got to employ the right consequences. There is a powerful consequence you need to use when you start an HOA parking lot sweeping program. It’s called negative reinforcement. This is the most common consequence that most people are familiar with. You can sum it up in this simple sentence, “do this or else”. It sound somewhat heavy handed, but it doesn’t have to be. However, it’s the primary consequence you need to employ when setting up a HOA Parking Lot Sweeping program. There are many examples of negative reinforcement. Most people don’t want to get a speeding ticket, so they drive under the speed limit. Most people don’t want to get fired from their job, so they show up for work on time and do their work effectively. Negative reinforcement does not have to be heavy-handed, it just has to be communicated properly. When it comes to an HOA parking lot sweeping program communication is key. Ensuring that the residents know well in advance about a regular parking lot sweeping program goes a long way towards minimizing conflicts. 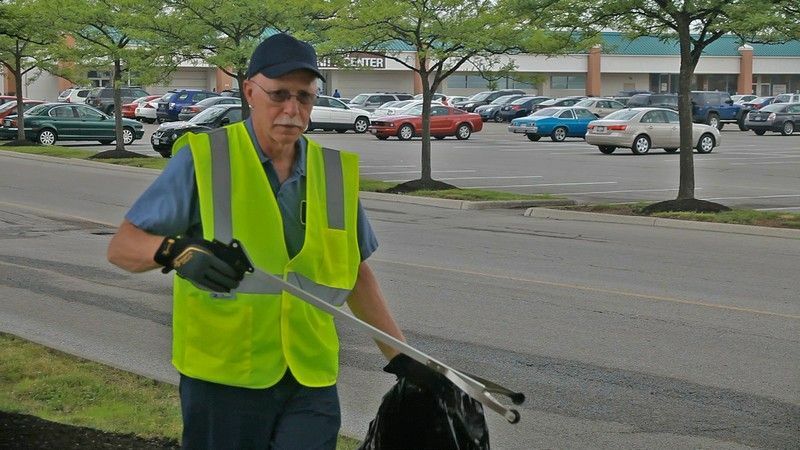 Approximately two months before the start of the program a separate letter should be sent to each homeowner informing them that an HOA parking lot sweeping program is going to be scheduled. Include the specifics regarding the dates, the times, the requirements, and most importantly, the consequences if requirements are not met. The key to communication is both repetition and variety. Communicate consistently and in a variety of ways. And document these communications for the resident who will claim that nobody told them. The letter should be followed up a week later with a printed flyer that is hand delivered to each residence because not every residence receives notices from the management company. Some residences are rented so they may not get notified by their Landlord. Several weeks before the parking lot sweeping program begins, small signs (about 11 x 17 tablet size) should be staked around the community where every resident can visibly see them. A few days before the program begins, conduct a mass phone notification campaign (these phone services are now readily available to all homeowners associations). Generally, the main requirement is to ask the resident to move their car out of the parking lot that’s being swept on the sweeping date. Invariably there will be residents who will forget, or ignore the requirements. If the sweeper has to sweep around a particular vehicle, the sweeper should take that picture of the license plate and send the picture to the HOA. If the HOA can identify the car as owned by resident, they can send a letter asking the resident to adhere to the requirements and move their car on the next sweeping date. They can also respectfully remind them of consequences for future non-compliance. Moving forward, consequences must be initiated on non-compliant residents. No exceptions. Although it’s tempting to let one or two violations slide, it’s important to remember that without consequences people will not change their behavior. Also, if you are going to apply consequences to one person, it’s only fair (and legal) to apply the same consequences to all. Although it does seem like a lot of work to communicate, followup, and enforce requirements, the outcome will be that most people will cooperate. Those that don’t won’t have a leg to stand on when they suffer the consequences. Need Help with your HOA parking lot sweeping project? Are you involved with a Homeowners Association Board? Would you like to discuss ways to improve your community’s overall appearance? Our services include community sweeping, pavement maintenance, seal coating, and line striping. If you’re in North Jersey, Contact us at 908-730-7884. If you’re in Central New Jersey call us at 732-886-1940 to arrange for HOA parking lot sweeping. Builders Construction Sweeping – Why Are You Procrastinating? How often have you been angry with yourself for waiting to the last minute? Wait for the last minute for tickets – they’re sold out! Wait to the last minute to buy clothes for an important affair – your size not available! Wait for the last minute to take care of something at Motor Vehicles – stand on a long line for a long time! You’ve learn over many years and through painful experience that waiting until the last minute has unwanted consequences. So if you’re a builder, this is why waiting for the last minute to schedule street sweeping also has unwanted consequences. Probably the first and most compelling reason for scheduling a sweeping project before the snow is for safety. Even if you have a one or two inch dusting of snow this can hide debris that can cause safety issues. Some of the things that can be hidden because of snow are chunks of concrete, pieces of asphalt, wood cuttings, gravel, and unfortunately, beer cans. When people drive over this debris with their trucks it ends up in the tires. If someone is walking on the snow (a contractor or a client) and they step on any of this debris, they trip and fall. We live in very litigious society, so it’s a bad practice to allow potential lawsuits that can be prevented with construction sweeping. The next reason is that construction sweeping will improve the appearance of the property, whether its a newly started site or if it has been under construction. Although most people prefer to view properties during warm weather, there are still many buyers out there who need to (and will) inspect property during the cold weather. Scheduling a construction sweeping before snow arrives helps improve the appearance of the property even after snow has dropped. A construction site looks more tidy with clean snow as it melts rather than dirty snow that turns into a mushy, debris-laden mess. And finally the availability of construction sweeping services is best right before ice cold weather and snow set in. Scheduling a construction sweeping is easier, faster, and more convenient before the bad weather hits. After a snow, many sweeping services are busy with snow removal and other winter property maintenance projects. Get that sweeping “to do” off of your list and pick up the phone today! Get your sweeping project done before the winter. Shopping Center Sweeping – Should You Sweep The Parking Lot Before or After the Winter? 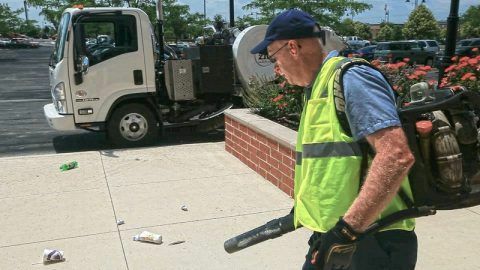 Perhaps the question I get asked the most about shopping center sweeping is, “when is the best time to do a thorough parking lot sweep and clean? Should I do it before the winter so there is not much to do when the winter is over? Now I know that’s not a definitive answer, which is frustrating but there are several questions that need to be answered in order to give a definitive answer. Shopping Center Sweeping – First question is how big is your parking lot? The size of your parking lot really determines whether you should have parking lot sweeping at all. Small shopping center parking lot – If your parking lot holds between 20 and 50 cars this is a rather small parking lot. You should rely mainly on manual portering you keep your parking lot clean. The shopping center sweeping is usually done with a simple broom and hopper pan. Medium shopping center parking lot – If your parking lot holds between 50 and 500 cars then a good sweeping can spruce up the parking lot. Not only will the appearance improve, But you can prepare the parking lot for other types of improvement projects such as asphalt repair, pothole patching, seal coating or lien striping. 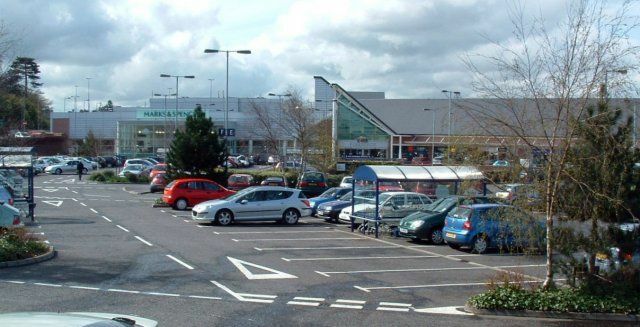 Large shopping center parking lot – If your parking lot holds more than 500 cars then you probably have a substantial piece of real estate that needs maintenance. This is a parking lot that should have regular sweeping and maintenance. So going back to the question should you sweep the parking lot before or after the winter you see now it depends. It appears that the weather really shouldn’t be part of the decision making process, it’s really the size of the parking lot that dictates the need for shopping center sweeping. What should I do Before the winter to prepare my parking lot? Inspect the Parking lot – Grab a pad and a pen, then go out and walk the parking lot. Walk in a back and forth pattern to inspect the condition of the asphalt, concrete and cleanliness of the lot. Do you see any areas that need repair, replacement, painting, or cleaning? Note these on your pad. When you get back to the office rate these on a scale of 1 to 3. 3 is a nice to do. Consider the items you rated as a one to be the most critical that need to be completed prior to the winter. Concrete repairs, curbs, sidewalks, parking stops, ballard bases, decorative concrete. Rate anything that could cause a trip or fall hazard as a particularly critical item. Crack filling, sealcoating, and striping or not quite as critical, however if the striping for handicap parking for traffic flow has started to fade, it’s best to touch it up before bad weather arrives. Do you have your snow removal and ice melt supplies in good condition and ready for the first snow emergency? although items listed above appear to be a lot of additional work, these tasks can be completed in a few hours. So getting back to our original question about Shopping Center sweeping, we’ve given you a lot to think about and perhaps have answered the question for you. Shopping Center Sweeping – Need Help with Your Shopping Center Parking Lot? C & L Services is a third generation family owned property maintenance company. We have been providing property maintenance services to Homeowners Associations, commercial property owners and communities in New Jersey for over forty years. If you’re in North Jersey, Contact us at 908-730-7884. If you’re in Central New Jersey call us at 732-886-1940 to arrange for shopping center sweeping.. In spite of the variety of different cultures throughout the world, there’s one thing that almost everyone on the planet has in common: they want to live in a clean environment. There’s some other common elements as well. People also want to be healthy, they want their families to be safe, and they want to live in an attractive community. Certainly there are many areas of the world where this criteria is hard to achieve, however almost every country (whether developed or still developing) has a Department, Bureau, or Community organization that is in charge of keeping streets clean with a professional sweeper service. In this article we’re going to take a look at the variety of street sweeper service practices throughout the world and how different cultures keep their communities clean. There are different restrictions that street cleaners need to deal with depending on where in the world they are. Weather – In areas with cold winters such as the Northern parts of the US and Canada, sweepers that use water to loosen debris and minimize dust can’t sweep because the water can freeze and cause a hazard. Cold weather areas use street sweepers with powerful brushing actions and a strong conveyor belt systems to get the grit, salt and debris into the debris hopper. Environment – Coastal areas have more sand to deal with. In rural areas with lots of trees, there is a lot of leaf and vegetative debris on roadways. Some countries have tourist areas that create a lot of party trash, (Brazil during carnival and Dawali in India for example). In some mountain areas of Switzerland, the sweeper service uses special sweepers are used to collect hay that farmers move to the roads. Age of City – Before the advent of cars, horses and foot traffic were the main modes of transportation. Streets only needed to be wide enough to accomodate two horses. In Europe, narrow streets are often an issue, and many of those streets are made of cobblestone. Street sweepers that use vacuum suction or powerful brushes dislodge cobblestones and damage the street. The sweeper service in these areas often use smaller street sweeping machines Either custom built or manually operated) to deal with the challenge of narrow streets and passageways. China and Taiwan: Street sweepers in many Asian countries are less complicated, whether the sweeper is a brush or vacuum system. In China and Taiwan in particular, the mechanical street sweepers typically employ two brooms placed vertically on the back side of the hopper to move dirt into the hopper. Asian countries also still employ manual labor to sweep the streets since labor for this type of work is both plentiful and cheap. United Kingdom: In the U.K., street sweeper technology has limits due to the sensitive historic areas. Vacuum-based technology dominates the options in street sweeping in the U.K. Since the streets in the older cities are quite narrow, street sweeper trucks tend to be quite small. Copenhagen, Denmark: Copenhagen is a very progressive street sweeping city. This city is always testing new technologies, especially sweeper that are environmentally sensitive. Amsterdam, Holland: Amsterdam often uses a team street sweeping effort, using what is called a train system. A water truck is in the lead and sprays the road with high-pressure water to loosen debris and move it away from buildings. The a hand-broom crew follows and sweeps the debris into the path of the sweeper. Sweepers with controlled power finally vacuum the refuse to avoid damaging the cobblestone areas of the city. Moscow, Russia: Heidelberg uses a fleet of high powered water jet to blast clean the streets. The street are usually free of traffic (I’m not sure if this is by decree or people have learned to keep their cars out of the way!). Well that concludes our tour around the world of street sweeping. but since we’re in the good old USA, we’re going to do it the way we’ve been doing it for 40 years. C & L Services is a third generation family owned property maintenance company. We have been sweeping and servicing shopping centers, commercial properties and communities in New Jersey for over forty years. We can help you keep your property in excellent condition with reliable, dependable, cost-effective services. If you’re in North Jersey, Contact us at 908-730-7884. 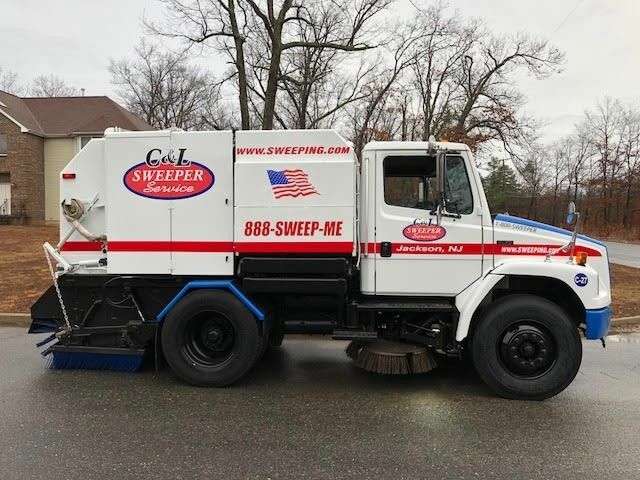 If you’re in Central New Jersey call us at 732-886-1940 to speak with an experience company that can meet your needs for a professional sweeper service. Keeping the streets clean on a construction site is a challenge for builders, construction managers and field supers. Even subcontractors can run into problems when the streets are not clean on a construction site. 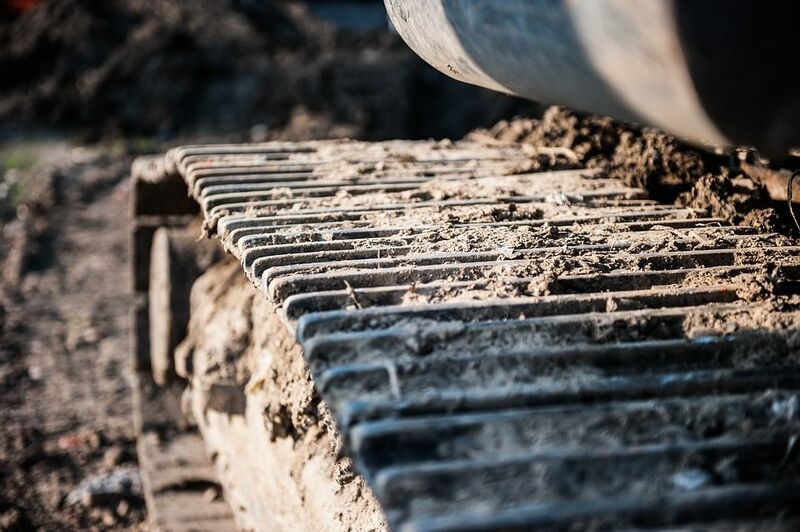 Fortunately, however, the people in charge of a construction site don’t have to tolerate the issues caused by a dirty construction site once they know how to take some preventative measures. That’s what you’ll learn in this article. Specifically, you’ll learn how to recognize potential problems with keeping the site clean. You’ll also find out how to prevent clutter and debris issues and manage them if (and when) they occur. So, without further introduction, let’s jump in with a discussion of sweeping construction sites and keeping them clean. One of the most consistent issues with construction sweeping is working around cars and trucks parked everywhere. A busy construction site could have between ten to twenty different contractors working on any given day. If each contractor has a car (and many have several cars and trucks) the parking situation can get quite chaotic. Ground Rules – every site is different, so each site will need a different set of parking ground rules. Take a few minutes to brainstorm potential parking problems for the site and possible solutions…then get input from the staff and contractors. When involved parties are allowed to have input on things that affect them, they tend to accept and follow the ground rules. 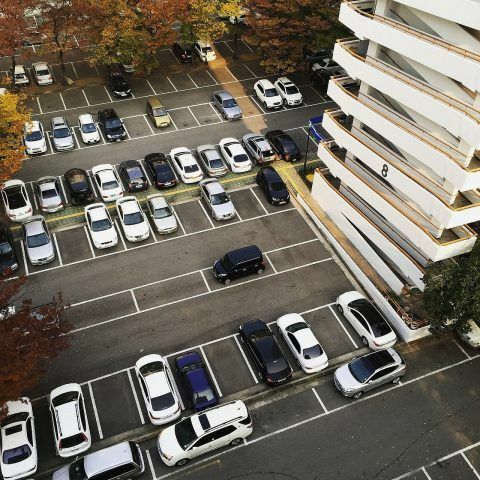 Some basic ground rules should include where and where not to park, being mindful of other workers on the site, parking dispute resolution procedures, who to contact if there is a question about parking (or anything else). Offer incentives for violators – although the preference is to punish ground rule violators, use positive reinforcement for a first warning. If you encounter a first time offender, rather than giving a stern warning, use the “you probably didn’t realize” approach for the first offense. Hand them a map and go over the ground rules. If they become repeat offenders, use appropriate consequences to reinforce the parking ground rules. Recognize that not only are the ground rules there for cleanliness and health reasons (and for construction sweeping accessibility) but everyone benefits from cooperation and a focus on safety. Schedule – Assigned specific clean up tasks every day at specific times. The end of the day is usually the best time to get these chores done. Separate tasks such as disposing of litter, disposing of flammable or toxic materials and organizing the worksite and provide a checklist for their completion. Also, assign tasks to specific people rather than a crew. Accountability for specific work is more measurable when specific individuals are responsible for specific outcomes. Separate materials – Different materials should be disposed of in different ways. There may be recycling requirements in the municipality where the job site is located so separate scrap material into piles accordingly. Also identify usable materials and separate them to avoid accidentally throwing them away and consequently wasting money. Many pieces of usable (and expensive) fypon trim has been damaged and thrown away because they were not separated and stored correctly. One of the main reasons why many sites become unsightly is because expectations for cleanliness (and behavior) are not communicated. Make some time to identify what is expected from the staff and contractors and communicate these expectations consistently. The saying, “Inspect what you expect” is not just a cliche, it’s an effective management tool. First identify what you expect, communicate it to staff and workers then “inspect what you expect”. Everyone will get the message that cleanliness, safety and cooperation is important on your site and you’ll end up with fewer issues and an attractive, clean and problem-free site. Oh, and regular construction sweeping will help with that as well :-). C & L Services is a third generation family owned property maintenance company. We have been sweeping and servicing real estate developers, commercial properties and communities in New Jersey for over forty years. Most people don’t have the responsibility of managing a street sweeping project. However, if you now find yourself needing street sweeping services or changing your service provider then this is the right article for you. Fortunately, people who need street sweeping services don’t have to do extensive research in order to find the right sweeping vendor. We will share with you why sweeping is important, when you need it, and what you need to look for to select the right type of service. We will also recommend some additional resources if you have specific needs. Sweeping – Why Is It So Important? If you’re responsible for keeping a community clean, it’s important to get an experienced sweeping service that can do the job within your budget. Community residents who pay taxes are looking for the biggest bang for their buck. Also sweeping not only improves the visual appeal of a community but also provides health benefits to keep pollutants and pests out of the neighborhood. If you’re in charge of a construction project there are specific environmental regulations that must be conformed to. Keeping pollutants and construction debris out of lakes and streams is an important part of being a good neighbor and nobody likes to pay fines, so street sweeping is a required part of the construction process. 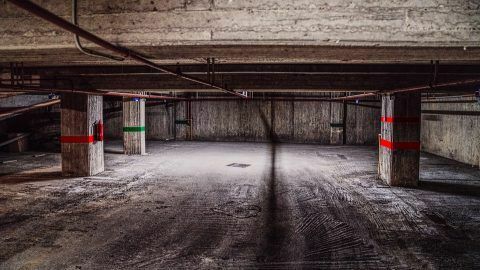 if you’re a commercial property owner that provides parking lots to your tenants and their customers, you need to keep the parking lots clean so your property is attractive and your tenant’s content. Although the primary purpose of the sweeper is to keep the pavement clean, there are different types of sweeping services for different purposes. Our typical street sweeping vehicle. For community and parking lot sweeping, you’ll find that the typical sweeping truck will do the job effectively (view our image to the right). A commercial property may require additional services such as portering. Portering includes a maintenance professional who physically inspects the property and removes debris from curb stops, bollards, dividers, planter and decorative structures. Basically. anywhere a street sweeping machine cannot reach requires the attention of a porter. A sweeping professional also conducting portering services. Construction sweeping may require as sweeping vehicle that can handle larger pieces of debris such as nails, small pieces of wood in concrete, pieces of roofing material, Etc. also because pavement Maybe in different stages of completion there are more irregular surfaces the deal with. The operator of a sweeping vehicle on a construction site usually has more experience then the standard sweeping vehicle operator. this operator has to have an Eagle Eye and a good ability to interact with construction site contractors and supervisors to get the job done. As with most maintenance projects, planning and preparation are the keys to a successful project. If you’ve never managed a sweeping project before, reach out to the sweeping vendor and discuss the requirements of the sweeping job. Review your expectations, outcomes, and any obstacles that need attention prior to the sweeping project. Allow the sweeping vendor to share their insight into how they would approach the project and the resources they have available to do the best job. A physical inspection of the property is strongly suggested by both parties so potential issues can be resolved prior to the start of the project. If the property needs repairs such as crack filling, pothole repairs or concrete replacement, schedule these as either smaller projects or included in an overall larger property improvement. Keep in mind that projects that are larger in scope require more planning an lead time. We’ve actually gone into more detail in another article which you can view here. Street Sweeping- When Do I Need It And How Often Should I Do It? Quite often the need arises for street sweeping services with some urgency. Please note that there are peak periods during the year for street sweeping services and to plan ahead whenever possible. Street Sweeping – What If My Requirements Are Unique? This is where having an experienced, resourceful sweeping vendor can reduce stress. We can help you keep your property in excellent condition with reliable, dependable, cost-effective services. If you’re in North Jersey, Contact us at 908-730-7884. If you’re in Central New Jersey call us at 732-886-1940 to speak with an experience company that can meet your needs for sweeping. I’m sure by now you are aware that the common street sweeper has been around for a long time and they are everywhere. What you may not be aware of is that there is more technology to these rather noisy machines the most people think. The science behind the water, the brush, and the technology may surprise you. All of these elements combined in the modern street sweeper help keep neighborhoods clean, improve the environment, and keep people healthy. Here’s a few surprises that many people do not know about today’s modern street sweeping. Sweepers were one of the first mechanical vehicles to appear in cities and residential neighborhoods. The very first street sweeping machine was patented in 1849 by its inventor C. S. Bishop. Motor-driven street sweepers actually started appearing in the streets of Boise Idaho in 1914. This was the Elgin motorized street sweeper built by the Elgin Sweeper Company headed up by Mr. D. M. Todd. Many people think that the water sprayed by a street sweeper is for cleaning…It’s not. The water sprayed by a street sweeper is actually a technique to keep dust on the road while the cleaning bristles sweep debris into the hopper. Spraying water on the street is required by environmental laws to keep dust from fouling the air and contaminating the environment. If you see a street sweeper kicking up a lot of dust, then the water jets are either clogged or the water tank on the sweeper is depleted. Tube brushes – that have bristles attached throughout the tubes or strips of bristles attached in rows. The bristles are made of either steel, polycarbonate or a combination of both. Gutter brushes – are shaped like a flat disk and rotate to push curb debris to the tube brushes. The tube brushes then “sweep” the debris onto a conveyor belt which drops it into a collection hopper. Debris (trash, leaves, branches, etc) from the sweeping is collected in a storage bin called the hopper. Storage hopper’s come in all different sizes and need to be emptied regularly to avoid jamming the conveyor belt and damaging the mechanical components of the sweeper. 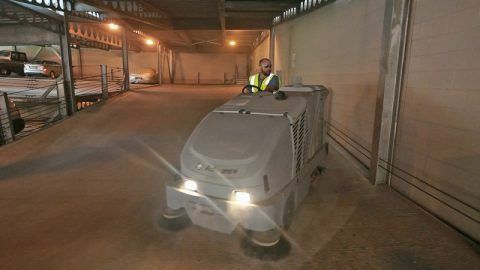 Sound Dampening – Between the diesel engine, rotating brushes and spinning conveyor belt, a modern Street sweeper can be in noisy affair. 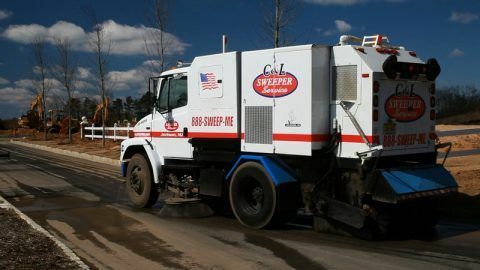 Sound dampening technology is being built into modern street sweepers with quieter Motors and Better Sound insulation. Vehicle power – with the focus on environmental impact, newer street sweepers are being powered either by electric battery or natural gas. natural gas has been in use in a number of cities for the last decade. Air sweepers – are also being equipped with vacuums and air scrubbers that eliminate the need for the water spray which is particularly useful in regions that are experiencing drought. How Can C & L Services Help You? We can help you keep your property in excellent condition with reliable, dependable, cost-effective services. If you’re in North Jersey, Contact us at 908-730-7884. If you’re in Central New Jersey call us at 732-886-1940 to speak with a professional street sweeper. How many times have you thought about street sweeping drivers? However, thinking about street sweeper drivers can be enlightening. There’s far more to the job than people think (and people rarely think about street sweeping). They are actually the unsung heroes of clean, tidy and healthy. So let’s have a look at street sweeping drivers in more detail, and then you’ll learn how to appreciate what they do the next time you notice them on your street. Street Sweeper Drivers Vehicle Dashboard. Looks like the instruments in an airplane, doesn’t it? Route Assignment – although there are some drivers that have been driving the same route for years, most drivers are assigned different routes weekly and sometimes daily. Drivers must either call in or log in to a central office daily to obtain their assigned route for the day. Weather check – Drivers also do a weather check to determine the conditions (rain and snow are not optimal conditions for street sweeping) and to obtain alternative assignments if the weather prevents street sweeping. Equipment inspection – driver’s conduct a full inspection of the vehicle which includes fuel check, control panel inspection, hopper inspection, tube and gutter sweep check, conveyor belt check, and overall operation and maintenance of the vehicle. Depending on what type of street sweeping being performed that day, there are differences in the tasks and obstacles for the assignment. If a driver is performing residential street sweeping, the driver must pay attention to obstacles such a cars pulling out of their driveways, children playing, and critters of all types scurrying about. Because the driver is moving at a slow speed, other vehicle operators actually become impatient and make careless moves around the sweeper. Sweeper drivers need to be extra cautious because of this risky behavior. If the driver is performing construction sweeping, there are not as much traffic to deal with, however the driver needs to be very attentive to the type of debris that’s being picked up. On a construction site, large debris such as cinder block, chunks of concrete, or large pieces of scrap wood need to be avoided. If the driver is sweeping a shopping center for commercial parking lot, there are lots of curb stops and bollards to look out for. And with all sweeping assignments, the driver needs to keep an eye on the hopper. The storage hopper needs to be emptied regularly before it reaches capacity. When the street sweeping assignment is done, the driver doesn’t just lock up the vehicle and go home…there are some post assignment tasks that need to be complete. We can help you keep your property in excellent condition with reliable, dependable, cost-effective services. If you’re in North Jersey, Contact us at 908-730-7884. 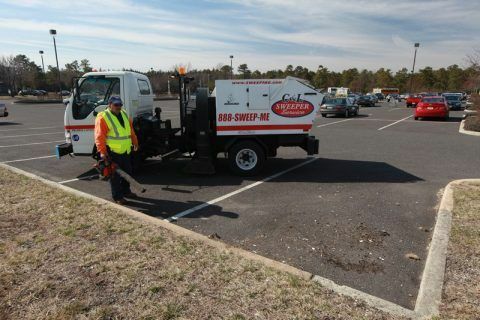 If you’re in Central New Jersey call us at 732-886-1940 to speak with a professional about effective street sweeping.